We can reduce Cycle Time with Little’s Law. Let me explain. 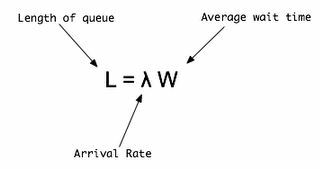 We know that Little’s Law is the average number of customers in a system (over some interval) is equal to their average arrival rate, multiplied by their average time in the system. TH = throughput (arrival rate). This is the velocity or speed of production and is calculated by determining how many items are produced and dividing it by the length of time it took to produce them. It can, of course, be computed from Little’s Law as TH = WIP/CT. CT = cycle time (average time in the system). This is the time it takes to complete the production cycle or the average time it takes to produce one unit. Generally, determining cycle time requires either direct measurement or can be computed from Little’s Law as CT = WIP/TH. WIP = work in process (average number of units or customers in a system). This is the number of items currently in production or being serviced in some way. This figure must be measured (counted) directly or can be computed from Little’s Law. And, you can also transform the equation below to find the average wait time for a system, whereas the above tells us the average length of the queue, or how many people are waiting in line. (CT = WIP/TH, CT = 200/50, CT = 4). This means we can accommodate new orders of 50 units each day and the system will remain balanced. But suppose we receive an order for 85 units, 35 more than the standard order of 50. The WIP would increase from 200 units to 235, and because TH would remain constant at 50 units per day, CT would immediately increase from four days per unit to 5.4 days per unit. Significant levels of new orders cause production efficiency to decrease. This can be done through process improvement. That is, identify waste in a system – especially waste that is present in the system constraint – then systematically eliminate it. Commit significant investment to increase the scale of the system to better handle the increase of WIP. This is fine when considering longer-term system capacity. It is impractical, however, when addressing relatively short-term variations in demand. Only this option can be used to effectively address these short-term demand variations. Reducing WIP may require some counterintuitive actions, such as temporarily pulling projects or orders out of the workflow and setting them aside. With the resulting decline in WIP, cycle time drops and the remaining projects get done better and faster, so much so that projects originally pulled out of the workflow can then be reinserted and completed on or before the original target date. In other words, by stopping work on a project, it gets done faster. Little’s Law is a wonderful tool that can help us better understand what are seemingly complicated and dynamic processes. But, underneath it all, Little’s Law describes the connections in dynamic systems well and allows us to proactively improve the system. Bob Echlin • Excellent review Peter. Thanks. Dan Trietsch • Quoting from the post: “With the resulting decline in WIP, cycle time drops and the remaining projects get done better and faster, so much so that projects originally pulled out of the workflow can then be reinserted and completed on or before the original target date. In other words, by stopping work on a project, it gets done faster.” Are you talking about reducing the effect of congestion? That is, making it easier to walk and work on the floor? If so, you got a point albeit without having said so clearly and depending on whether queues are indeed physically present (so shifting them physically helps). Other than that, it is simply not true that by postponing a job you can finish it in time. One of the things people don’t understand about limiting WIP in the system is that it automatically shifts waiting to some conceptual queue outside the system. I am not opposed to this shifting: it is good in terms of postponing actual investments in those items and reducing said congestion. It may also be justified sometimes to preempt a very long job to promote several small jobs (even though it is against the religion of some). But I am opposed to ignoring the external queue. In conclusion, I agree wtih Richard up to “Forgive you for that” and on the positive side the graphic L = “lambda” W looking like “LAW” is something I have never seen/noticed before. Did Little intend it to be seen that way? 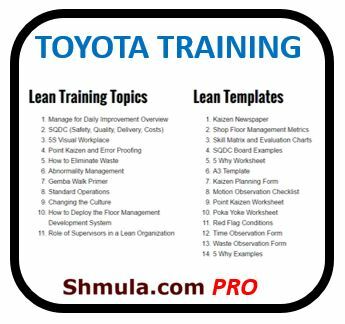 Prasad Velaga • Isha, you seem to have a good understanding of lean manufacturing. However, I want to comment on one of your views. Improvement in the efficiency of bottleneck workstations can not only increase throughput but also reduce both WIP and lead times. The proponents of Little’s Law can help me understand how the simple law captures this point. In this case, lead time (W) and queue size (L) decrease and lambda increases. Some WIP is necessary to protect throughput against the impact of randomness (natural variation) in the system. For specific throughput and WIP, you have the corresponding lead time as given by Little’s Law. When we reduce the natural variation in the system, both WIP and lead time will decrease. Six sigma is necessary for this purpose. Bob Sproull, Lean Six Sigma Master BB/Jonah • Peter, excellent portrayal of how Little’s Law (it’s actually a tautology) can be used to improve throughput. My work is based in an MRO operation and one of the first things we did shortly after I arrived was to use Little’s Law to calculate the necessary WIP in the system to achieve a given level of throughput for a necessary cycle time. 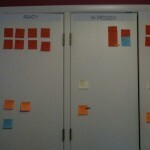 This was our first step prior to implementing Critical Chain Project Management. We achieved a C/T reduction of nearly 40% on our first try. We too focused our Lean and Six Sigma efforts on the system constraint and for each product line the results got better and better. It’s amazing to me that more organizations/people aren’t using both Little’s Law and an integrated Lean, Six Sigma and Theory of Constraints (a.k.a. TLS) to maximize profitability. Maybe with more discussions like the one you started here will move this along. Thanks Peter for stimulating this discussion. Prasad Velaga • Bob, could you please explain more clearly “Calculate the necessary WIP in the system to achieve a given level of throughput for a necessary cycle time”? For example, the necessary cycle time is 14 days and the given level of throughput is 10 per day. Do you want to keep the average WIP in the system at 140 for this purpose? In my view, WIP is to protect throughput against variation but not to “achieve” certain level of throughput. Bob Sproull, Lean Six Sigma Master BB/Jonah • Prasad, I would be happy to explain. 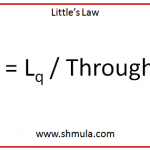 Think of Little’s Law as an equation that must be balanced (i.e. the left side must equal the right side of the equation). The equation is, WIP = C/T x TP. If the TP is known (i.e. the customer demand) and, for example, we know what the C/T is, then we automatically know what the WIP should be. Likewise, if we have a given amount of WIP and we know what the TP must be, then we can calculate the required C/T (i.e. TP = WIP/(C/T). One of the key take-aways from this law is that excessive WIP lengthens the C/T, so WIP explosions should always be avoided. I want to recommend a great book for you entitled, Factory Physics by Hopp and Spearman. What you’re suggesting is that WIP should be used as a buffer, but I believe that buffers should be a combination of time and product. Understand, I am a disciple of the Theory of Constraints, so automatically, we think differently. Great questions Prasad! Prasad Velaga • Bob, thanks for the explanation. Dan, I wonder what else I am going to read in this thread. Abhinav Sinha • I am totally agreeing with Ms. Isha Dubey on her views of cycle time reduction. But also i want to add some more on reduction of cycle time. Companies could always go for trying to achieve line balancing method which would help the whole process to pull together in the same way. It is like the concept of Drum-Buffer-Rope. Again the unnecessary movements could be removed by redesigning the layout of the flow process and trying to achieve U shaped instead of straight line used everywhere. This would drastically reduce the travelling time of the material and also more visibility is maintained between different work stations simultaneously. The so called undesirable WIP also gets reduced upto 75% without going for anything drastic. Just simple steps helps to achieve so called standard set by the process of World Class Manufacturing companies. Bob Sproull, Lean Six Sigma Master BB/Jonah • Abhinav, I am a bit confused by your posting. How in the world do you equate line balancing to Drum-Buffer-Rope. DBR recognizes the existence of a constraint and pulls material into the line as product exits the constraint. If you’ve read the book Velocity, line balancing is not a good approach if you are trying to optimize throughput. Dan Trietsch • Hi all, Subject to Prasad’s correct reservation, I also agree with Isha and with Abhinav too. I also agree with Prasad that Little’s Law is not relevant, a point on which I elaborate below. All in all, that’s about all I agree with in this post. Factory Physics (FP) was written by two colleagues of mine who understand queueing theory. They are not supporters of the so-called “Theory” of Constraints (“TOC”) AT ALL, although it is on public record that one of them took a Jonah course from the late Eli Goldratt. Later he lamented the fact that he was the only one in the class who questioned the correctness of Goldratt’s teachings, whereas the other participants, mostly practitioners [who do not really understand queueing theory], swallowed everything hook, line and sinker (my words, not his). The same author also said that the “Theory” of Constraints is not a theory, and he was right. FP is a solid attempt to present a correct version of “TOC,” not one that is based on blindly following a mesmerizing guru. They suggest, correctly, is that if we limit the maximal WIP (by an approach they call CONWIP, which has similarities to DBR but IS NOT identical to it), then the system will behave better. But they do NOT suggest that you can use Little’s Law to calculate the necessary WIP limit. CONWIP–which I prefer to call CAPWIP (because you can’t keep WIP constant, you can only CAP it)–was later adopted by the TOC crowd under the title S-DBR (simplified DBR), but to this day “TOC” disciples refuse to admit that the original DBR is junk (although Goldratt himself admitted that it requires a major overhaul in a 1988 paper that he published in an academic journal). Now, the necessary WIP to assure a particular TH level is a function of variability in the system and it is ALWAYS higher than what Little’s Law suggests. Why? Because Little’s Law gives the AVERAGE WIP and the average is always smaller than the maximum! Therefore, if I understood the post about using Little’s Law to calculate the necessary WIP in the system, I must say that it is simply incorrect. On the bright side, again, the posts about proactive actions necessary to reduce variations are more relevant to reality. However, I prefer to think about the discipline that teaches us how to do that as JIT rather than Lean/SixSigma or any other modern buzzword. For instance, U lines are a classic JIT development (based on GT ideas originally developed in the Soviet Union during WW II). Give credit where it is due: the JIT discipline does it all, including pointing out which resources need to be improved to enable cycle time reductions. Those U lines also sport the basic CAPWIP idea, because there are no kanbans within them, so even that is not originally a “TOC” idea. Wherever we stray from JIT–e.g., in the DBR direction or even in the arbitrary SixSigma direction–we reap suboptimization. Lean/SixSigma only work where they essentially use JIT. Indeed, my understanding is that “lean” is just a new term for JIT, and likewise, for a while, “agile,” but I can’t say the same for Six Sigma. Six Sigma is an attempt to revise the quite stupid Zero Defects idea into something more realistic, but it is not sufficiently smarter than ZD and thus it is not a correct way to focus variation reduction efforts in a system. I’d like to finish on a personal note. 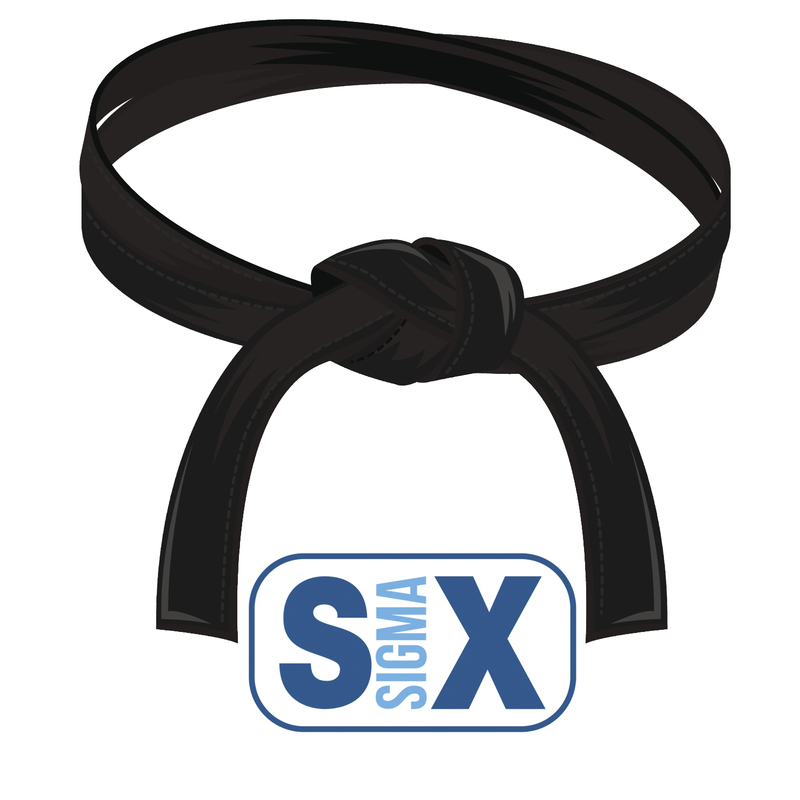 There must be many “TOC” groups out there, as likewise re Six Sigma, but I never considered joining them. I figure that disciples have the right to join like-minded people and reinforce their beliefs by interacting with those other disciples, all without interference from opponents like me. Similarly, I would not dream of going into a church to argue against the religion or sect of the disciples. But this group is not committed to any such approach and thus if one or more of them is promoted here it is almost the duty of opponents to speak up. I don’t expect to convince any disciple, but at least the criticism should be on record. Bob Sproull, Lean Six Sigma Master BB/Jonah • So Dan….I assume that your mind is closed on TOC…even though there are many examples of very successful implementations? Of course your argument will be since you don’t believe it…how could it possibly work. I still hold firm in my belief that TLS is the methodology that delivers which of course includes Lean, Six Sigma and TOC. Have fun with this discussion Dan. Dan Trietsch • Bob, Please don’t assume you know what I think and how open my mind is. Before I start, there is another name for the correct aspects of “TOC” that I can write without quotation marks: Management by Constraints (MBC). I will use it in this thread from now on where I can. If you read my post carefully you will see that I am supportive of FP’s aim to build a correct approach on the basis of “TOC.” What I didn’t say is that it is very close to MBC. In fact, I personally used MBC extremely successfully in my consulting in the US Navy almost 20 years ago. However, I never accepted the “single or very few bottlenecks” hypothesis of Goldratt’s so, independently from the FP authors, I used CAPWIP. MBC allows and eventually achieves balance in systems (by repeatedly implementing step 4–elevate–PRUDENTLY). Hence it works. Another thing I stated starting 25 years ago was that MBC is isomorphic to PERT/CPM (which also has the focusing on constraints approach–you crash only critical activities). However, in 2002 I discovered two things which turned me into an opponent of “TOC” (but I still consider MBC solid). It was then that I read Goldratt’s Critical Chain for the first time (but at the time, I did not know that CC was due to Pittman 1994). First, not knowing about Pittman, I thought Goldratt cynically turned around and used the focusing principle of PERT/CPM to invent a “NEW” way to focus in project scheduling. Second, Goldratt “proved” that balance is detrimental, thus proving that he did not understand what he was talking about. Since then I have developed the MBC idea into the concept of Management by Criticalities and I developed CC into PERT 21. So my mind is not “closed” to MBC, but rather I am beyond MBC, and onto a much better way. But it’s true that my mind is closed to “TOC,” because it is FALSE. Here is a link to what I think and what I wrote on “TOC.” (It goes as far as Management by Criticalities but not yet to PERT 21.) You don’t have to read it, but unless you do there is no point to continuing this debate. Let me know, however, if you want to see a PERT 21 link. Dan Trietsch • Isha, let me respond to your first post of the last two. For this purpose I will invoke two very basic queueing formulas. I am not suggesting they reflect reality but they show the behavior I want to explain. The first model is M/M/1: Poisson arrivals, exponential processing times, one server, NO limit on WIP. The average WIP in this case obeys Little’s Law, of course, but it depends ENTIRELY on the rate of demand (arrivals to the system) as compared to the rate of supply (service). You can think of those rates as the products of the sales arm, which generates demand, and the production arm, which actually delivers the physical items or services required. If demand exceeds supply, the classical theory says WIP will explode. Well, it won’t explode but it will grow without control at an average rate that is a tad above the difference in rates. If you want to control WIP in such a system you have no choice but to reduce service time or reduce service variance. In the M/M/1 context that can only be done by increasing the server’s rate of service (which reduces both the mean and the variance in this instance). If you don’t, the customers will balk. Which leads us to the second, more interesting model: M/M/1/K. That model assumes that if there are K customers in the system than any additional customer balks immediately (which means that this customer is lost). Now, I wish I could draw you a picture but you must do it yourself. Draw two small circles at some vertical distance. Call the top one of them “supply” and put a nice Greek “mu” in it (for the service rate). Call the other “demand” and put a nice Greek lambda in it (for the arrival rate). From the top, supply, circle draw a circular arrow towards the bottom, demand, circle. On the other side, draw a counter-symmetric arrow from demand to supply. The result so far should be two small circles connected by outside arrows in a circular shape. The arrows show flow directions: the one from demand to supply shows sales that queue behind the server (supply). The one from supply to demand reflects product output. Finally, inside the big circular shape, put the number K. This is an unconventional but simple diagram of the M/M/1/K queue. Now notice this: there are exactly K units in the system. Those between demand and supply represent a physically visible queue of orders awaiting service. Those between supply and demand represent potential new sales. If there are no units awaiting or receiving service, then all K units are awaiting the “demand server” — i.e., the lower small circle. Symmetrically, if all units are served or awaiting service, no new sales can be generated. In this model supply and demand are completely symmetrical, and there is no rule that one of them should exceed the other. Now, in this system, throughput depends on K. Reduce K and there will be a lot of idling and WASTED CAPACITY. Increase K and throughput will increase, but at the expense of increasing lead time. So what you must seek is the correct balance between lost capacity and increased lead time. By your post, you only see one side of the coin. Dan Trietsch • One final point: in this system K represents the cap on WIP. So if you increase your cap, you lose throughput and gain lead-time reduction. Of course, here too variance reductions as well as speeding the server up will help. Thus the model shows that Prasad’s comment way above that improving speeds and variances helps is correct. If anybody tries to teach you differently they do not understand what they are talking about. Sorry, but it’s that simple. Isha Dubey • Dan: Thanks for the detailed explanation about M/M/1 model in queuing theory I am very much aware of the this theory and has been taught to us by the experienced professionals in India.I understood well your example of drawing two circles one as supply and the other as demand. In M/M/1 model we say the optimum situation is one in which the service rate and the arrival rate should be same. Keeping up inventory levels for constraints is also true.But the fact is we should limit this inventory to the required quantity at each workstations so that they can be utilized at the time of any constraining problem or halt to keep up the throughput constant.Another thing if the demand keeps on fluctuating like 50 to 85 we need to work on the line balancing aspect rather than building up inventory to meet the fluctuations. As stated by you ” K represents the cap on WIP. So if you increase your cap, you lose throughput and gain lead-time reduction. Of course, here too variance reductions as well as speeding the server up will help.” Why do we need to increase the capital when the optimum WIP can be maintained at each stations to avoid the constraints…like what is the concept of DBR!! Isha Dubey • From Abhinav Dan: I am not able to understand why you are so keen not to accept the above points. This is so very simple of not complicating the matters but to accept them in the most simple way. 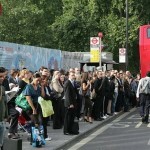 You are saying about applying the concept of queuing theory but that has a flaw. Queuing theory models are based on the exponential distribution, thus the model has the traits of the exponential distribution. The main problem lies in that the exponential distribution has a coefficient of variation of one. This fact precludes the modeling of any process that has a coefficient of variation significantly different from one. Now because of the low likelihood that any random process will have coefficient of variation as ONE, thus they become rather impractical to apply. Also in support of my above comment posted by Isha and hers above comment, keeping a certain level of WIP in the system doesnt make any problem, rather it helps to maintain certain buffer in case of failure of any workstation. This has been made cleared above only. So instead to going for some radical changes and lots of thinking its better to accept small easy solutions which are easily understood by all in the production floor instead of going for complex models and charts. Dan Trietsch • Abhinav, Unfortunately, we are going nowhere fast. For instance, what exactly is the statement “This is so very simple of not complicating the matters but to accept them in the most simple way” supposed to mean? You call that “simple”? And what simple thing am I so keen not accept? In short, I am totally confused by your message. In addition, you clearly misunderstood my example and the caveats that went with it. Your comments about the limits of the exponential and the need to balance supply and demand exactly demonstrate that, but I doubt I can explain it here. A good source would be the same Factory Physics text recommended here previously; please consult them especially with respect to the approximate simple transformations from the exponential to general distributions: nothing changes qualitatively, ONLY quantitatively. Anyway, here is what counts: Lead time should be reduced for many reasons, mostly to do with customer satisfaction, avoiding harmful systems dynamics and avoiding cancellations and changes to orders. That requires reducing processing time and reducing variance. In addition we must THEN put a limit on the maximal WIP to avoid congestion and to be able to provide reliable due date performance (except to those customers who find the system booked and whose orders must wait outside in a conceptual queue: they may have to be quoted higher due dates). Do not confuse the need to reduce lead time with trying to save inventory holding costs, a noble but usually minor objective. For instance, to reduce lead time it may be necessary to INCREASE inventories of raw materials and spare parts. You can decrease them only if you have reliable JIT suppliers, preferably nearby. Goodnight, over and out. Prasad Velaga • Abhinav said, “Little Law gives us the basis which says that WIP directly proportional to Throughput. So in order to increase throughput we need to increase our WIP”. This interpretation is correct only from mathematical point of view. Some mathematical relations like Little’s Law or the famous Einstein’s equation E = m*c^2 are quite often deceptive. Many people many not see which variables are independent and which ones are dependent. How many people see c (the light speed) as the square root of the ratio E/m? Can we increase the energy E or decrease the mass m in order to increase the light speed? Abhinav’s interpretation of Little’s Law is similar. In production environment, I do not want to see throughput as the ratio of WIP to lead time although it is mathematically correct. Otherwise, I will be tempted to increase this ratio for improving throughput. The following is my approach. I first want to enhance the “effective” processing rates at bottleneck workstations for improving throughput. Waiting times, transport times between operations and many other non value added activities (as indicated by Isha) do not affect throughput. They simply increase WIP and prolong the lead times. Therefore, they must be reduced for controlling WIP (inventory on shop floor) and lead times. Note that cutting a pipe of uniform length by half will not increase flow rate through the pipe. As the next step, I will try to find right WIP level to protect the achieved throughput. 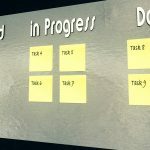 Both DBR and kanban control consist of this step. I take the lead time as a consequence of the two efforts. Isha Dubey • Prasad, me and abhinav never stated that “Waiting times, transport times between operations and many other non value added activities (as indicated by Isha) do not affect throughput. ” But what we always tried to stick to the notion here…reduction in cycle time. We are not discussing here what is the idea behind throughput or something, we were just trying to elaborate more on the strategy behind reducing cycle time. One cannot decrease or increase throughput so easily until unless there is some change incorporated in the whole layout or implementing line balancing for an increased demand(please make a note of this point). The other points which I have quoted above strictly relate to the reduction in cycle time and has nothing to do with throughput. Exactly as you are saying that in mathematical formula one should not try to make relations in different manner, similarly throughput is not the concern here. The main thing is cycle time, which is actually large in companies. The reason behind is not just the processing times but some time extra needed for procurement, inspection, storing, material handling, material check, storage counting etc. These involve time and Cost as well. Thus overall the time of delivery or the lead time to the customer is quoted higher than the cycle time. One more thing to be noted here is that CYCLE time is very much different from LEAD time. In real situations Cycle time is less than the Lead time. I think this discussion is leading us nowhere, may be we are not able to make our point clear here.We are really thankful to Bob, Dan and other members to cooperate with us. Hope to participate again in next discussion. Thanks! Bob Sproull, Lean Six Sigma Master BB/Jonah • Isha, I am always anxious to participate in these discussion and thanks for making your points known. I may not agree with all of them, but I am certainly opening to listening to other points of view. Prasad Velaga • Isha, you said, “In M/M/1 model, we say the optimum situation is one in which the service rate and the arrival rate should be same”. Home assignment: Find out the theoretical implication of the service rate being equal to the arrival rate in M/M/1 queue. “If the demand keeps on fluctuating like 50 to 85, we need to work on the line balancing aspect rather than building up inventory to meet the fluctuations.” Yes, to deal with fluctuating rates at workstations, one can maintain certain WIP or some protective capacity or both. Adopt the most economical approach for this purpose in any given situation. I am not sure Peter started this thread with a focus on lead time reduction. You and Abhinav seem to have gone in that direction. 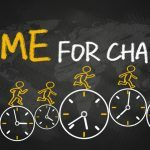 Isha Dubey • Yes, I think the topic says so…Reduction in Cycle time and not Lead time..therefore we started this discussion on reduction thing…Well thanks so much for this discussion forum, I really gained a lot.. hope it turns out to be a healthy one!! Dan Trietsch • I said I won’t comment any more because I felt my explanations were not coming through anyway. However, let me say this: in his two last messages Prasad could have been speaking directly for me. I agree with every word. Richard Shipperbottom • Some sparks flying in this discussion, eh? Isha/Abhinav – you have it spot on. Dan, I thought i was the only one with a mission to debunk the rediculous aura of six sigma, toc et al (I’m a frustrated JIT boy of old). However, the great thing about the original post by Peter, and why I liked it, is that it makes people THINK (evidenced by the above posts). His examples are typically ‘theoretical’ – i.e. rubbish, but in applying it to real situations you’d soon find that out…Interesting that at the bottom of the original post some chap from a call centre was commenting about how to use it…I just hope he wasn’t from a call centre I’ll be using: Little’s “Law” isn’t an equation you can use out of the box (I admit never having used it), and if anyone tried to use it like that they’d need to hand the factory keys back. Perhaps a more pertinent ‘theoretical’ debate might start with “I don’t want ANY wip” , or “I want to increase throughput without spending money on new kit” – I don’t think I’ve ever had a client demand a reduction in ‘cycle time’ (lead time, yes) – or “i want to improve the service level to my customers”. It perhaps also helps to try thinking about trading, not manufacturing (where it is possible to get negative throughput if you applied Little’s Law out of the box). What I love most about all this is how it illustrates the huge difference between academic/theoretical knowhow (Poisson arrivals, Dan? You need to get out more:)! ), and business reality. I am impressed by Isha/Abhinav’s maturity given that you’re both students. Isha Dubey • Richard, thanks for appreciation, I am not in a view to discourage any one for his/her discussion or post, actually I am being so junior to all, it is an opportunity for me to learn. I have acknowledged so many facts here which even I was unaware of specially the ones quoted by Dan and Prasad. We have a subject called World Class Manufacturing, where we have been taught this reduction in cycle time as a topic, in which we focused majorly on the reduction of cycle time. The most important principle which we were taught was to make the customers happy!! and serve them like a king!, for this reason we need to measure our ON TIME DELIVERY parameter. This is cycle time vs Lead time. The lead time(Time taken in executing all the activities right from procurement to delivery) is the time of delivery committed to the customer and the cycle time is the processing time or the time needed to obtain a value deliverable to the customer. Generally these two time are very different from each other. In an ideal situation both of them should be equal for keeping the customers happy as well as saving costs. One might be thinking how does cost comes into picture. As the main objective of any business is to make money now and in future…thus the return on capital employed should be high. The costs associated with the inventory (fixed+current, WIP) is inversely proportional to the returns we get. Little’s law says we need to modify our inventory levels to meet the changing customer demand what I understood from the example of 50 to 85 units and thus change of 200 to 235. This is like if the demand increases should we also increase our inventory?? Can’t we optimize the production process like what Abhinav commented as using LINE BALANCING along with maintaining little buffer at each stations (Drum Buffer Rope) concept. This is the case when the demand increased, but the point which I am trying to make is that we just need to reduce the unnecessary operations(Material handling, storage, inspection at each level, transportation). This can be only done when the design of the whole layout is changed. This also involves human factor, there work-ability and their motivational level. There are long queues, waiting times and long transportation routes to be followed unnecessarily when the two workstations can be kept close by. Generally a plant doesn’t have the design section, in some plants there might be, this is the reason why it takes time for implementing any design changes instantly and doing FMEA for any default in the production process. I am not experienced at all, but what I am commenting here, strictly relates to the life examples. I am thankful to all, for their generous cooperation. Dan Trietsch • Richard, I quoted M/M/1/K as a basic model that shows something general. I said right away that the exponential is not realistic. I resent being attacked on a point I made myself. Factory Physics is a good source that explains how the same “something” generalizes to any queueing model. NOW, IF YOU ARE SUGGESTING THAT QUEUEING THEORY IN GENERAL IS NOT PRACTICAL, WE LIVE IN DIFFERENT WORLDS. If you are not suggesting that, please don’t fault me for using the simplest relevant example when trying to explain something fundamental. It is strange, though, that in the same post you say (correctly) that Little’s Law cannot be used the way people here were suggesting and then you endorse posts that include that junk. Granted, they do so only indirectly, but they do say WIP should be reduced without any recognition that there may be a limit and a downside to that. For instance, the posts you endorse in such a wholesale manner contain the following little gem (by Isha, addressing me): “As stated by you ‘K represents the cap on WIP. So if you increase your cap, you lose throughput and gain lead-time reduction.’ ” Well, the whole purpose of my example was to demonstrate the EXACT OPPOSITE: increase K and throughput goes UP (albeit at a marginally decreasing rate). Now, the WIP Little’s Law speaks to is the part of K that is visible in front of the server, but it is an increasing function of K. Therefore throughput is an increasing function of K, and so is WIP (and Little’s Law is working correctly). The error in Abhinav and Isha’s posts that I commented on was that they ignored the beneficial aspect of increasing WIP and instead preached zealously for reduction ONLY. Given the misinterpretation that increasing the WIP cap HELPS throughput, it is understandable that they think decreasing the WIP cap can ONLY HELP. But they are wrong there. As I said in my first post on the matter, they are right with respect to potential action to reduce variance, but that too is not always very easy in practice. Talking about practice, in very flexible plants one can change the layout quickly. Advanced JIT plants in Japan has been doing that for decades. But in most plants it takes a long time and major efforts to change the layout. In such situations you do not “increase WIP” to support throughput but rather you avoid decreasing WIP too much so throughput does not suffer. The way to go is to decrease WIP prudently, “expose rocks,” remove the “rocks,” and only then decrease more. If you encounter a “rock” that you can’t remove, do not decrease the WIP cap any more until you can remove it. You may even have to ratchet the WIP cap back up a bit to accommodate a “big rock.” That is the JIT approach. One last comment: Factory Physics is by far the best textbook on the subject out there. Nonetheless, they too missed the point about sales being part of the bigger system. Perhaps as a result, they do not say anything about adjusting the demand level as part of managing a system. Nobody else does either. The circular queueing model I gave is NOT from FP, or from any other book. (so I am very surprised to hear, Isha, that you know that model–to my knowledge it has never been published. However, such ideas do tend to emerge independently.) Be that as it may, it is a model that I personally use to teach my students how WIP limits work and the trade-off between the WIP limit and throughput. Then I take the next step and teach them how to adjust the whole system. I planned to get there in this thread too, but finding myself under attack I decided to abort that part. I read this post and thought about at least two situations in a Call Center environment, reduction of Average Handle Times (or time it takes to process a call, start to finish) and cases that get delayed in queues. Both are potential projects I would like to start working on. Pete, your post is really helpful. It gives meaning to topics everyone at work is aware of but don´t quite understand why, me included. Thank you. Thank you all for your contributions. Every one of them forced my mind to think of the things I have done by instinct. We seem to have a lot of theories but not much actual experience quoted. Nothing operates in a vacuum and the two areas I see missing are the Capital constraints and the contribution of the sales department. The last company I worked for we turned out orders in an average of 7 to 10 days which ideally would take 4 to 6 weeks. We were constrained by capital as we were not allowed to buy steel coils until we had an order, headquarters mandate due to lack of capital. Customers wanted delivery immediately in the business of new big box stores or refit of same. I changed the requirements by going after an industrial market where longer lead times were the norm and we could shine with our fast times. Also reduced the price on standard sizes to encourage choosing them over similar non standard components. Reasoning also that if you collected a large number of smaller orders even though they were discounted more heavily than.normal , we would be more profitable running same components in bulk without machine changes (4 to 8 hours). Also buying similar steel meant more utilization of same coil in less time. Increased sales of this new product by 40% in two years. But never able to get a true profit figure out of it because we had to report to corporate along with a sliding scale contribution. Often wondered whether that was intenteniol to bolster main company profits to secure continuing financing. That was the real world! I would welcome comments on my reducing price of similar components to nudge customers into them resulting in less expense during throughput.